The moment a child is born is one of the happiest moments of most parents’ lives. The rush of joy is truly unique, and completely transforms your value system. But as you progress into parenthood, you start facing situations that you most likely don’t have answers to, like the reasons why babies cry. If this is exactly how you feel, then keep on reading. While doing our research we found that there were a vast number of situations where babies reacted with crying. Because babies can’t talk, to tell you exactly what is bothering them, you have to basically do guess-work. Deciding to read this post means that you want to take control of the situation. Learning from the collective experience of professionals and fellow parents is very easy in the information age, and also the smartest thing to do. Probably the most frequent reason for a baby crying is hunger. This is the case especially with young parents who haven’t had the time to adjust to the baby’s needs yet. If your baby starts crying out of the blue, he might be trying to tell you that he’s hungry. This is the first thing you should check, at least until you get accustomed to his feeding needs. Some babies will let you know about this stinky situation right away, but others will not, being able to tolerate it quite a while. If your kid has this tolerance, then you might want to check on him once in a while. This is because once you will be able to smell the problem, it could irritate him, developing into a reason for constant cry for a while. So make sure to change his diaper as fast as possible once you’ve identified this problem. You would think that babies have it really easy because they could technically take a nap anytime they feel like it. Many babies, though, get pretty angry and irritated once they feel tired, and then end up crying. You can swaddle him tight and talk, read or sing to him using your most soothing tone. Most times it will calm him down and help him fall asleep. If he’s past the newborn stage, just skip the tight swaddling. Babies are more sensitive towards changes in temperature. They tend to feel as too cold a temperature that you might think of as being comfortable. The easiest thing you can do is adding one more layer of clothes than you wear at any moment. Generally, babies will rather feel too cold than too hot. Actually newborns like to be tucked in well, being slightly more warm than you would consider warm enough. They will rather start crying when they feel a little too cold than too warm. Especially in the beginning, your baby wants and needs to be close to you, to hear your voice, see your face and even smell your unique odor (in case you didn’t know, yes, they are able to identify your unique odor). They also like to listen to your heart beat, because it’s very comforting for them. Don’t worry about spoiling your baby too much, especially during the first few months. It’s recommended you hold him as much as possible. This will, though, get to be quite exhausting after a while, so you might want to check out a baby carrier. Too little stimulation. Babies love the stimulation from the world around them. That’s the way they learn in their early months. Many babies who are happy and can’t stop laughing while receiving attention will often start crying when your batteries run off. The key is to plan more outdoor activities with your kid, meeting other parents with young children. When you go outdoors put your baby in a baby carrier, so he can see a lot of things going on around. Too much stimulation. As much as babies love stimulation, sometime it all can get too much for him. Although this will rarely be the case, it might be a reason for him starting to cry. When this happens you can swaddle him (all babies love it because it seems like they feel more secure), reading to him in a soothing voice. This will most likely calm him down, ultimately making him sleep if tired. Two of the most common troubles with newborns are associated with colic or gas. They will in most cases lead to a lot of crying. Colic is one of the most mysterious conditions. There’s no apparent reason for it but it’s supposedly making babies cry on average for 3 hours a day, for 3 days a week, for 3 weeks in a row. Children with this condition show no other health problems. Nobody can exactly say why this happens, but a fact is that it happens in 5 to 25 percent of all babies. It will, on average, last for about 4 months up to a year. If your baby cries right after feeding, chances are there’s some air trapped in his stomach causing a feeling of discomfort. This can happen because babies tend to swallow air when breastfeeding or bottle feeding. It will not cause him any harm, except of course, that feeling of discomfort. It’s not mandatory to get your baby to burp after feeding. Not every baby feels the need. So, help him with this issue only if he starts crying after being fed. One of the reasons that is likely to make your a baby cry is the growth of teeth. When teeth start growing they make their way through the tender gums of your baby, and the pressure can cause quite a discomfort. When you suspect that this might be the case, all you need to do to find out is to feel your babies gums with your finger. If you feel a hard nub, you just might have discovered your baby’s first tooth. As a general guideline, the first tooth could appear between 4 and 7 months. The best solution to try and ease this pain is to give him something to chew on, but the relief will only be temporary. 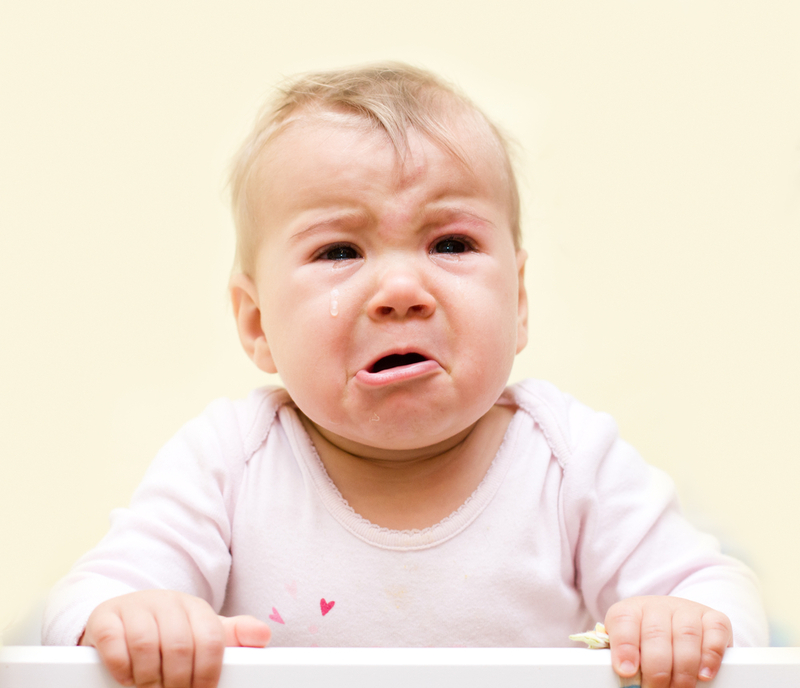 These are some of the most common reasons why babies cry. There can be other reasons too, and if you seem like you can’t really identify the reason for his crying, it’s always a good thing to let a pediatrician see your baby. If you found this post helpful, don’t forget to share it because other parents might find it helpful as well. Next post: What’s the Best Baby Bottle? Previous post: What’s the Best Baby Bathtub?